Welcome to the new or potential ringers page, below are a few questions you might be going to ask! A young ringer learning the back stroke. So, you want to know about bellringing? Is it something I could do? the other ringers (the 'band'). It's a bit like riding a bicycle - it seems hard at first, but once you've got the idea, you'll never forget. What happens when I've learnt to ring? You'll be able to ring for Sunday church services (the prime purpose of the bells is to call people to church) and for weddings. You can start to enjoy visiting other church towers, learning different 'tunes' (we call them methods), doing the ringing equivalent of the marathon (a peal, roughly 3 hours of non-stop ringing), meeting people from all walks of life with the same interest, sharing a pint with them in the local pub after the ringing, the list goes on and on. How do I get started then? click here and we'll put you in contact with a local tower. Go along to see what it's all about, you'll get a very friendly welcome. The style of bell ringing that we practice dates from the seventeenth century. It had developed gradually over previous centuries despite efforts of the Church to ban all religious bell ringing as part of the Reformation. Indeed, ringing stayed largely apart from the church until the late nineteenth century when associations were set up throughout the country aiming to ensure that church bells were rung primarily to call people to worship and to mark significant Church events. There are many ways to make a bell sound: some have the bell fixed and strike it by a hammer (clock bells sound like this) whereas others swing the bell and it is struck by a clapper which swings independently within it. The bell is normally pivoted somewhere around its neck and a rope is used to swing it attached to a lever connected to the bell. This arrangement allows the bell to swing up to perhaps the horizontal. Swinging the bell provides more sound than simply striking it with a hammer. Full circle ringing is almost peculiar to Britain and members of the Commonwealth. The lever is replaced by a wheel over which the rope passes and the bell is able to rotate through an entire circle starting from a mouth upwards position. The bell can be stopped completely in this up position. Full rotation gives the maximum sound from a bell because of the higher relative speeds of bell and clapper. Although the ringer has no control over the bell when it is in motion crucially he or she is able, by pulling the rope to control when it starts its rotation. This ability allows bells of widely different sizes to ring together in sequences known as change ringing. Ringers are aged from about eight to over ninety. They vary in skill level from absolute novices to seasoned professionals. 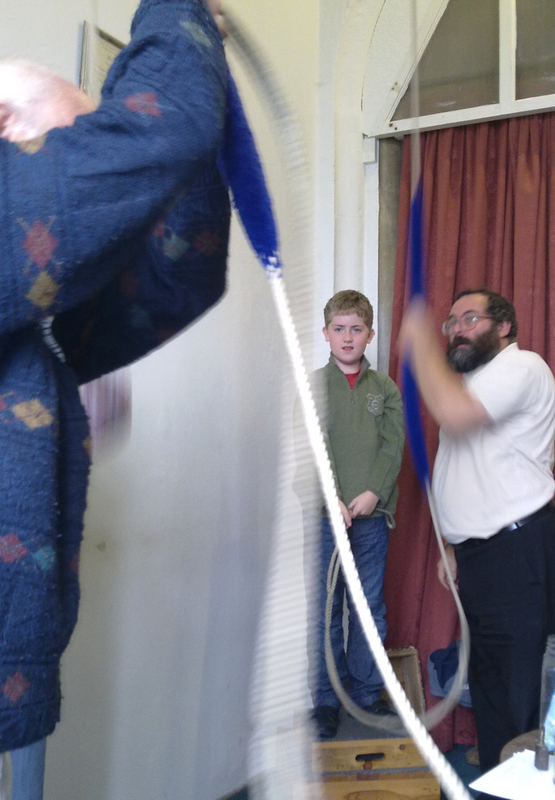 We must continue to recruit and train new ringers if ringing is to remain a living art. The ringers do not need to be particularly strong, musical or intelligent, but do need to be patient as the physical and mental skills required take some time to learn. The closest analogy to learning to ring is perhaps learning to ride a two wheeled bicycle; it takes about six months to learn on average but once learnt is never forgotten. A band of ringers normally practices for a couple of hours in the evening once a week. Ringing is enjoyable not only because of the ringing in itself, but also because each band is in itself a caring, Christian community providing friendship and companionship. Few other activities permit people of all ages to mix together on an equal footing. 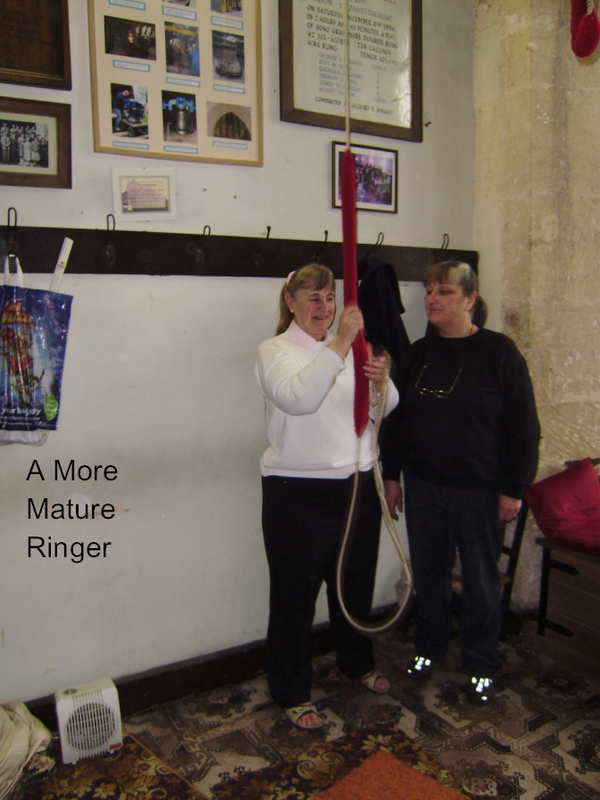 Ringers are also proud of the welcome extended to visitors in almost all towers; the degree of standardisation in the ringing and bell-fittings ensures that they can readily fit in wherever they go. This web site lists the towers in the branch, and the times when the tower practices during the week. The information above is from the Gloucester and Bristol Association web site for which we are very grateful. by using the links below to the newsletter and the branch calendar. If you would like further specific information use the email link on the left to contact the branch.